BeamMonitor - Laser Beam Diagnostics - Laser Mechanisms, Inc. 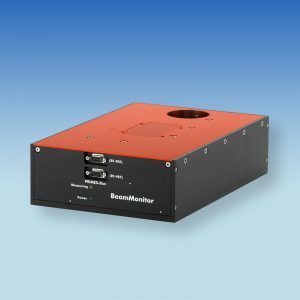 The PRIMES BeamMonitor (BM) is a measuring device for industrial use that performs beam diagnostics on unfocused continuous laser beams with high output power. Since the geometric data, beam symmetry and power density distribution can all provide indications of the optical quality used, its absorption and dirt contamination level as well as alignment problems, regular checking is helpful. The cause of the change to the optics is the often unavoidable pollution of the surfaces of the optical components or inadequate cooling. Especially in the case of transmission components such as output coupling windows or beam splitters, the dirt contamination results in higher absorption and thus creates thermal lensing. This influences beam diameter and beam divergence. The laser beam is scanned point by point with a rotating measuring tip. The mirror mount is also moved in a linear fashion to scan the entire beam profile. In this way, a partial beam is diverted and directed at the detector in each instance. The incoming signal is digitized and transmitted to the evaluation unit. The 14-bit A/D converter and resolution of up to 256 x 128 pixels employed enable an exact analysis even of small disturbances in the raw beam. The device was designed for use in harsh industrial manufacturing conditions and is adaptable to every spatial orientation. During the measurement, the entire beam exits the BeamMonitor again and must be absorbed as completely as possible. The BeamMonitor is operated from a PC. This enables the entire power density distribution to be represented within a few seconds. With an Ethernet connection, a maximum repeat frequency of 0.4 Hz is possible. Various application-specific solutions are available for operating the BeamMonitor. There is a graphical operating interface in Microsoft Windows®. The data transfer between the measuring devices is based on the RS485 protocol; hence cable lengths of over 50 m are possible. For programming via PC, the signal is converted to RS232 via an interface converter. Depending on the beam dimensions, various BeamMonitors are available with apertures of 60 or 100 mm. BeamMonitors BM60 and BM100 are available for CO2 or NIR lasers. A sizing rule is that the aperture ought to equate to at least 1.4 times the laser beam dimension. Otherwise, edge intensities can easily strike the housing or the measuring range will be restricted unnecessarily. That can lead firstly to the overheating of the BeamMonitor and secondly to the measurement result being falsified.